Boba Fett seems to get all the press. His dad was the one that was the geneitc pop of all the Clonetroopers. He managed to battle Jedi and live - well, right up to that last time. And when things got tough, he never lost his head. Until that last time. Yet his son gets all the bravo. A character that had more to say as a kid than he did as an adult. A kid who's claim to fame was his cool armor (which his dad already had), and who died when somebody bumped into him accidentally. 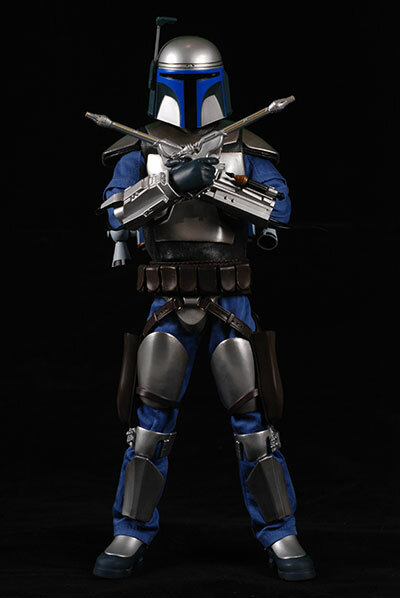 Medicom continued this son preference when the released their 12" Boba Fett first. 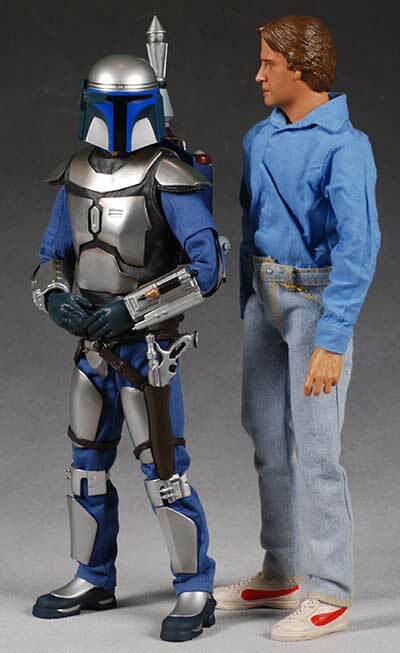 They've followed it up with pops though, recently shipping their 12" Jango. I already ran a guest review on this guy, but after opening him up I wanted to throw my two cents in as well. I pre-ordered mine through Sideshow, where he was $150. Believe it or not, that's actually a pretty good price for the RAH figures. You can still pick him up, but you may end up paying a premium at this point. The packaging is definitely dull. It IS collector friendly though, with no twisties or tape to interfere with your enjoyment. Pop him out, pose away, put him back - no problemo. Still, a little text, a little background, something would be nice. My other issue with these boxes is the flat black color is always scuffed up. There's no way to keep these looking decent over time, unfortunately. 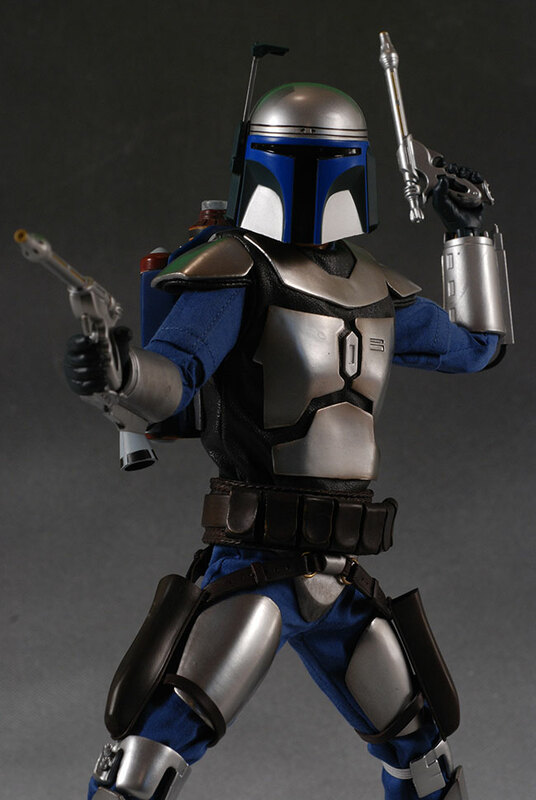 Unlike Boba, who had a generic unsculpted head under the mask, Jango gets the full treatment. I've been a huge critic of Medicom's human likenesses. There's simply no comparison between the lifelike work being done on the POTC line by Hot Toys, and the cartoony cheap look of the Medicom Jack Sparrow head sculpt. And don't even get me started on that anime meets car accident version of Luke Skywalker. So it's with great pleasure to see that this one turned out pretty damn good. There's still a *slight* cartoony look to him, mostly due to a nose that's a bit oversized compared to the character/actor. 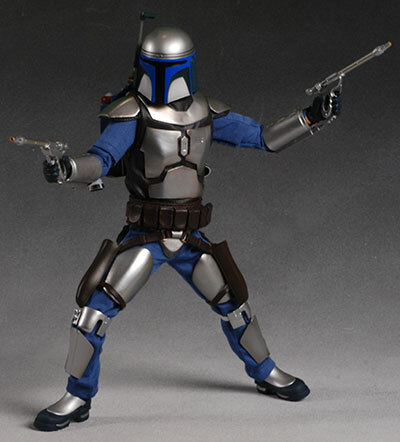 But the rest of the proportions are quite good, and it's a very accurate representation of Jango. The fit of the helmet over the head is extremely tight, so take some care when removing it and replacing it. There's some thin plastic film on the inside of the helmet to protect the paint on the front and back of the head, but you still want to be careful. Interestingly enough, I complained that Boba's helmet was a hair too big, even though it wasn't covering a fully sculpted head. 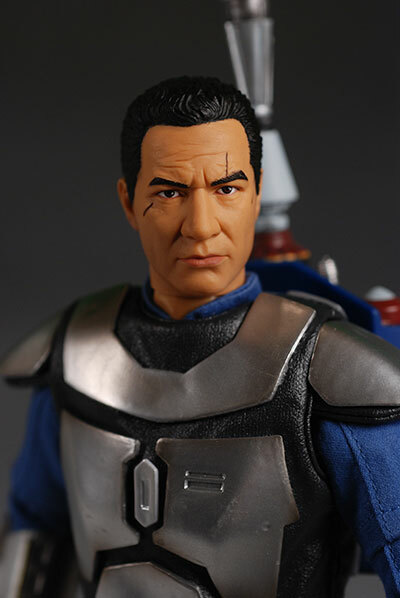 And now, Jango's looks dead on perfect to me, even though there's a full head sculpt under there. Have I lost my mind? I have, but that's not relevant. The reason is most likely the larger shoulder pads on Jango, which stick out a bit more on the sides, rather than droop down along his arm. Boba's tend to fit down the arm a bit more, making his shoulders narrower. 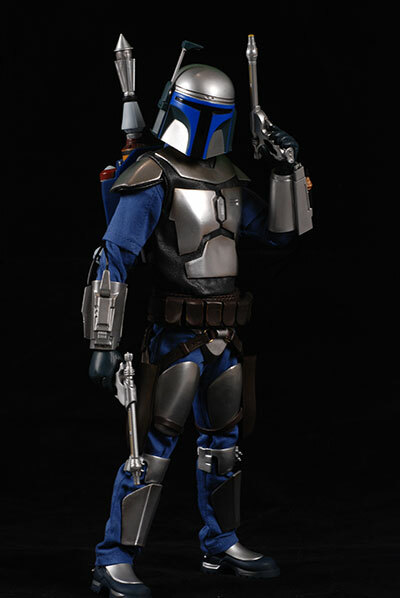 Jango's stick out a hair, making his shoulders wider, and therefore making the helmet appear perfect in size. The sculpting on the armor is again top notch, and it appears like real metal rather than plastic. The sculpted gesturing hands work good in tons of poses, and the sculpted gripping hands are designed to work perfectly with the blasters. In fact, almost too good, as I had a hard time getting the guns in and out of his grip. Once they were there, they looked perfect. I have one complaint on the overall sculpting, and I wasn't sure if I would include here or in the outfit category. As you can tell, I decided here. 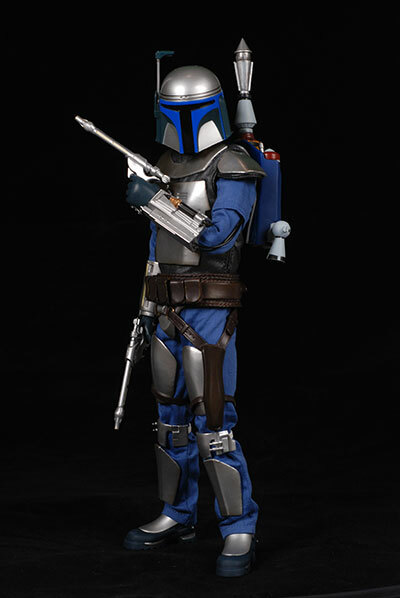 It's the jetpack, which appears to be identical to Jango's. As I recall, that's not the case, certainly not at the end anyway. This reuse is a disappointment, considering the price point. At least give us the blue and gray version as an extra. I'm going to bring up my old complaint here, although I know just how tired it is at this point. He's too short. I wish Medicom had gone for a more standard 12" scale body, rather than undershooting it a bit. I complain about the same thing with DCD and their 13" body, but they are really the only ones out there doing super heroes these days. With both Sideshow and Medicom producing Star Wars, it would have really been nice if they'd been able to fit together on the shelf a bit better. The paint work is generally stellar, with only a little slop here and there on the armor and pack. Of course, at $150 or more, any slop is an issue. The face work is great, with a nice even skin tone, and clean, straight eyes and brows. The scars are done perfectly, and the jet black hair is separated from the face by a crisp hairline. Even the lips have a slightly different color, but don't exhibit the dreaded 'lipstick' look. The metallic appearance of the armor is terrific, and really does give the sense of cold metal. There's not a ton of additional color or small detail there with the exception of the gauntlets, but what's there is done quite neatly. There's more color and detail on the jet pack, and there's also a bit more slop there. It's not terrible though, and this score almost pulled that extra half star. I love Hot Toys body...but after playing with this guy for over an hour as I was shooting the photos, I have to say that the Medicom body is still king. This body takes all kinds of natural, realistic, flowing poses with very little effort. I've got plenty of photos for this review, and it was very, very difficult to decide which two would be at the top and bottom in the larger size. Another big plus here is the easy to swap hands. While both Hot Toys and Sideshow do the same thing in theory, only Medicom does it with posts that are this sturdy and this easy to swap. 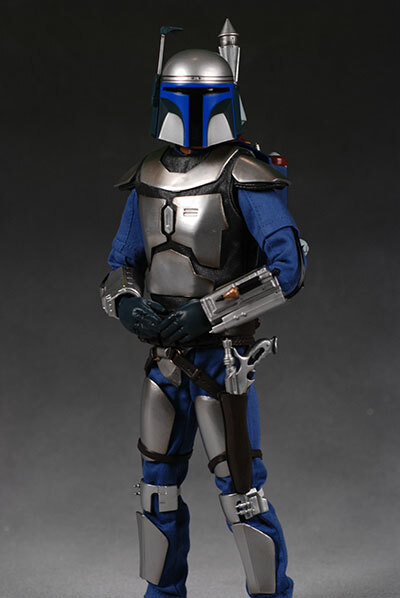 Jango's ball jointed neck is perhaps the best feature, although there are plenty of best features in this category. He can look up, down, tilt and do dozens of lifelike expressions because of this joint. The jet pack thrusters also turn, the range finder on the helmet moves up and down, and the rocket itself is removable, adding to the articulation further. 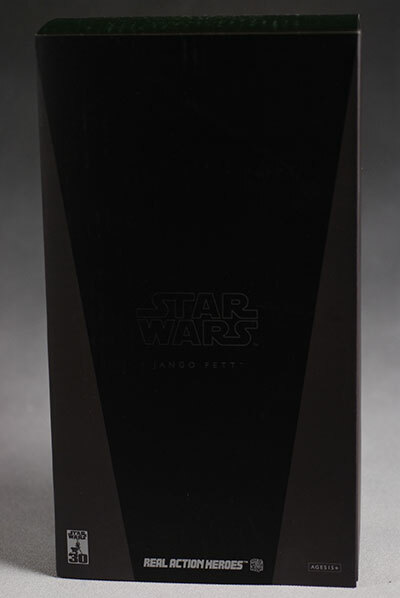 Jango is a tad light on the accessories, particularly for the price point. Thankfully, what they gave you is excellent. He comes with his two blasters of course, which are well sculpted and painted. They fit perfectly in the holster and in his hands, and are scaled accurately. Since the rocket itself comes out of the pack, I suppose it's an accessory. You'll probably leave it in place most of the time though. Finally, there's the usual display stand. I won't be using it - there's no reason considering how well he stands and keeps standing - but it's nice to have in case you do want to use it. I generally prefer Boba's outfit to Jango's, because I like the gray color and the added extras (like the Wookie braids). 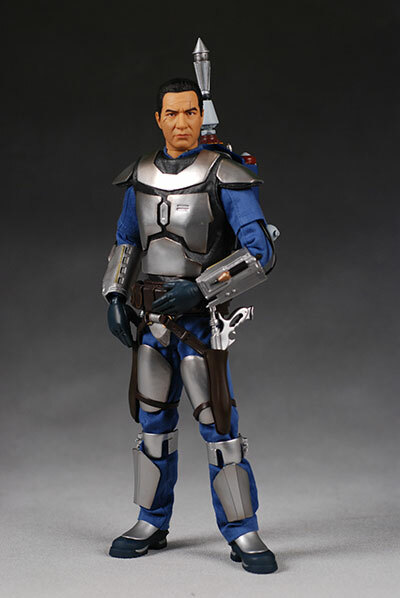 But this version of Jango outdoes the Medicom Boba for me, and I can't really find a single thing to complain about with the costume. The cloth suit under the armor is extremely well tailored, and hangs on his body in a very natural way. The armor is attached to it snuggly, and is unlikely to come loose with normal posing and handling. The chest and shoulder armor is attached to a nice pleather vest, which is very well made and looks great. The boot sculpts are great, and assist in his ability to hold deep stances and odd poses. The gauntlets have great sculpts, with more detail than most of the rest of the armor, and the thin black tubes fit into the upper arm cloth. They stay there with most poses, although they are too short to handle extreme arm pose. There were no kinks in mine. Some folks are going to not like the belt and holsters though. These are made from a hard plastic, and the pouches are solid. I don't mind though, and I think I prefer these to the soft leather we got with the recent Sideshow Luke. The leather rarely looks realistic in this scale, and this hard plastic is very sturdy and fairly realistic. There's also no worries about breakage. If you were so inclined to hand this over to an eight year old, they'd have tons of fun with it right up til they broke the range finger or tore the pack off (it's not meant to be removed) etc. etc. etc. Still, it's an absolutely perfect example of a collectible that hasn't lost sight of it's roots. This isn't a Nerd Hummel - this is a true toy, elevated to art statue. Unfortunately, all that elevation comes at a price. If you thought paying $75 - $125 a pop for Hot Toys figures was bad, you'll probably choke at the $150 or so that these Medicom figures pull down. Yes, he's a sweet figure, but he's a good $50 over priced considering the reused pack, standardized body underneath, and lack of accessories. This is a pretty sturdy figure, especially for the money. But I want to be sure you watch out for a few things. The guns look great, but the back piece can get broken off if you press on it. And you might be tempted to do so - or do so accidentally - as you fight the gun into his tight little mitts. The 'darts' on his knee pads are also easy to break off if you don't keep it in mind. Finally, there's the issue I already mentioned around the helmet. There's some thin plastic inside to help keep the head paint safe, but still take care. You know, there's no denying that these figures are too expensive. Oh, you can debate the issue when it comes to Sideshow, and even Hot Toys, but Medicom's line is just too much at this point considering the quality coming from the other big two at lower prices. 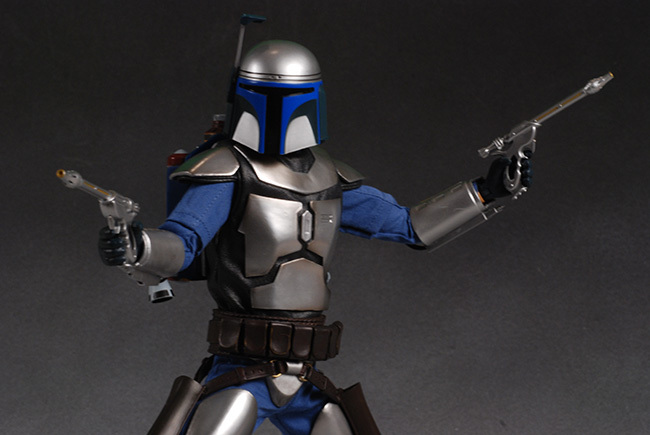 Still, when it comes to armored Star Wars sixth scale figures, Medicom is really your only option. 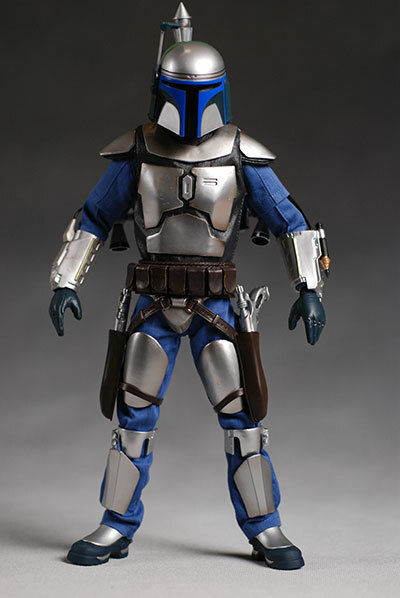 You could hold out and hope Sideshow will eventually do Jango...and a Stormtrooper, and Vader, and Clonetrooper, and Boba, etc. etc. etc. - or you could bite the bullet and pick these up. Yes, the price keeps him from getting four stars from me, but he's a damn fine figure nonetheless. - Amazing Toyz has him in stock at just $135, a solid price. - CornerStoreComics and Amazing Toyz has him at $150 still. - Alter Ego Comics has him at $175. - Or you can check out the Ebay action by using MyAuctionLinks.com to help you find them. - my review of the Sandtrooper and Boba Fett. - guest reviews of the VCD Yoda and Boba Fett. - guest reviews of the ROTS Vader, Jedi Luke, and this very Trooper. - and my review of their first release Darth Vader, the regular Stormtrooper, and Clonetrooper and Blackhole Trooper. - the last was Leia and Bespin Luke, the Holo-chess set and Sideshow's Asajj, a terrific figure. - in the premium format line, I've reviewed Darth Vader, Princess Leia, Boba Fett, Obi-Wan Kenobi, and Han Solo. - in the sixth scale line, I've also reviewed Yavin Luke, the Endor Troops, Jabba the Hutt and his throne, Bib Fortuna, Jedi Luke, Darth Maul, Obi-Wan, Bespin Han Solo, regular Anakin Skywalker and Kit Fisto. - I also have guest reviews of the SDCC Anakin Skywalker, Mace Windu, and Qui-Gon Jinn.